Stunning Keisha: Paging Nurse Keisha! Once again I've assumed my role as Nurse Keisha. I have to yet again apologize for not visiting my furrends but both my peeps have been waaaaaaayyyyy under the weather. After being sicky for about two years weeks, Pop finally went to the doctor and was diagnosed with an undefined "chest infection," which can be anything from bronchitis to pneumonia. TW has been feeling puny since Saturday and her doctor's appointment is tomorrow. While she hasn't been coughing as much as Pop, she's used a box of 180 snot rags in 3 days. Ouch! All she wants to do is sleep! Can you believe that?? Not only that, but to add insult to injury, she's comparing the way SHE feels to the way I felt last week. GASP!!!! "Oh, CK, remember how you felt last week when all you did was sleep, well that's how I feel now." As if, Woman! I didn't see you crammed in a box and shot full of toxic stuff like I was! That's her excuse for my lack of blogging and visiting and her lack of playtime for the cat. I'll expect a doctor's note tomorrow excusing her from playtime or it's playtime as usual. Glad you're nursing them so they can get well quicker. We're sure they will start feeling better since you are their nurse. CK, I can hear your German accent, "You vill get better, or else!" Oh noes! Its no fun when the peeps are sick! I have had my share of nursing duties this month after momma and daddy cames down with the flu. It was really bad. I do hopes TW and Pop feels better soon so that you can has your playtime! Aw, we're sorry your people are sick! What a sweetie you are taking care of them! They need to get better so they can get you back to your play routine! Oh yes a doctors note excusing her from playtime is a must. LOL did not know you a have the same term, snot rags. You crack me up Keisha. Have a terrific Tuesday. Oh, CK....I'm so sorry you've got to wear the nurse's hat again. Try to go easy on TW and Pops...they can't help it, being humans and all. I'm sure they'll test your patience, but remain strong. Once they're better you'll get your rewards. We are all purring like crazy for the all better to get there quick! Humans always turn illness into a drama. Heh. Oh CK we hope the peeps are up & about very soon! And that you're able to visit with us soon once again! Sorry to hear TW and Pop are sick, CK. We know that you'll nurse them back to health as soon as possible! Hope they feel better soon. My kids got me sick. I'm really not THAT sick though... just a sore throat and stuffy nose and stuff. awwww CK...you wear that nurses hat very well and I am sure you are the image of kindness and understanding for TW and Pops in their sickly times...heh...heh...oh, and you have noticed like everyone else in the entire universe has...I am not visiting a whit cuz "Mom" was away and now she is bizzy HAH! With a nurse like you on the case, TW and Pops are bound to get well soon! Feeling badly for your peeps, CK. It is APRIL after all, not the time for wintery ills. We hope they recover soon. Don't YOU catch anything from them! Hope your human gets to feeling better soon - and hey, maybe she will take so much medicine she forget that she just gave you a treat and you can get extra! We know with Nurse Keisha on the case, TW and Pops will be better in no time! We are all purring healing purrs for TW and Pops. It's no fun when the peeps are sick and all they do is sleep, though sleeping with them is good, too. Sheesh, CK! Didn't you just go through this? I can sympathize after WEEKS of trying to cure the Human; I don't think I've got it in me to resume nursing duties so soon. Wanna come over here and let them fend for themselves for a few days? Looks like you're ready for your job, CK. Hope everybody is feeling better quick, fast, and in a hurry. Oh Nurse Keisha, you do drive a hard bargain, that's our girl! Huge purrs to your Peeps for feeling better as soon as possible. CK, you look very cute in the nurse hat! Glad your peeps are in good paws. I hope they get better soon! OHHHHHH NOOOOOOOOO!! That is EXACTLY what my Mom and Dad had! They are STILL coughing and they finished their antibiotics over a week ago! We all hope your Mom and Dad are feeling better soon, that's a BAD one going around! You are a GREAT Nurse! I hope they feel better soon! I'm sure that you're doing a great job of looking after them. Poor TW! It sounds like she might have teh ebil plague that my Human had in early March. She missed more work then than she ever had before and even though she is 98% recovered now, she still has a little runny nose and a little residual cough--7 or 8 weeks later! Tell your Peeps to take it easy! YOu willl have them both up and playing with you in double time! You look adorable by the way. XOXOXO CK, and I hope your nursing dooties end pretty soon. I mean, showing that devoted, caring side is fine for a day or so, but after that it really gets old, doesn't it? Give them both cuddles and tell them we send our best purrs. 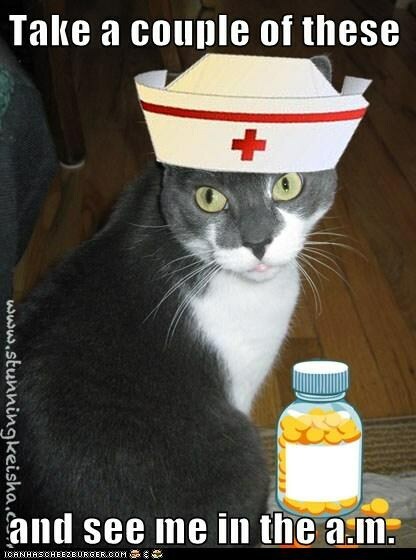 Ck Grrl Furrend, sick pawrents is awful! Me sends yous lots of patience!